The patrolTrack fleet management system is a perfect solution for tracking your fleet both in the PRESENT and in the PAST too. Through the Internet, you can check the vehicle data quickly and easily. From the distance covered by your vehicle or fleet, the patrolTrack system is able to make a road registry in a few moments. It is enough to select the requested vehicle, than set the period and the system automatically makes a professional road registry. The graphical representation of the vehicles’ speed is part of the basic service of patrolTrack. The system makes 24-hour graphs by GPS from the speed measured by the satellite. 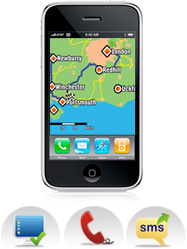 Follow your fleet through android mobile phone very easily. The patrolTrack unit is able to send notification about the alarming events independently and connected to the alarm too. If the user wishes, he can get notification about the alarms in SMS, over the phone and to his own dispatch centre. Users of patrolTrack system have opportunity to set own POI points, areas. In parallel with the settings of the own POI points, the users can mark out forbidden zones too. With this function you can create user levels, in which you can separate different access level categories for the colleagues who check the moving of the vehicles in your company. If you are offline, but you would like to know the present status, the position of your vehicle immediately, give a free call and the data will come soon in a text message.